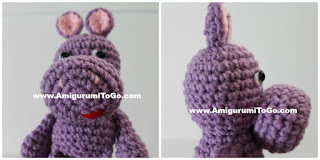 Meet the original Little Bigfoot Hippo. He is about 7 inches (18cm) tall. Date of birth: July 21st 2012 found here. He was reborn August 7th 2017 with this revised pattern given below. Same tiny hippo, better pattern. CLOTHING: there is an outfit coming for the smaller LBF patterns, I don't know when exactly. I'm working through a number of patterns right now, thank you for your patience. 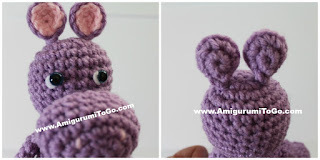 Okay, now let's make the OG LBF Hippo! Scroll down this page. Eyes: safety eyes go in between the 7th and 8th row with about 3 visible stitch holes between them. Before stuffing the muzzle add the nostrils and mouth. The nostrils are wrapped around the 3rd row with about 3 visible stitch holes between them. The mouth is in between the 2nd and 3rd row. Knot the yarns tails inside the muzzle and tuck the yarn tails inside. The top edge of the muzzle is sewn to the 10th row and the bottom is on the 13th. Pin the muzzle on first, use lots of pins. Make sure the muzzle stays centered as you sew. Take your time! Inner Ears: make 2 with alternate color and smaller hook. Inner ears are optional. I used hot glue to attach the inner ear to the outer ear. If you choose to do the same, be careful, that glue is hot! The ears are sewn or glued with wrong sides together. Once you have them together, sew the bottom edges of the outer ear together, this shapes the ear. Knot off and use the yarn tail to sew the ears to the head. 1) ch4 begin with a yarn tail long enough to sew into the body. 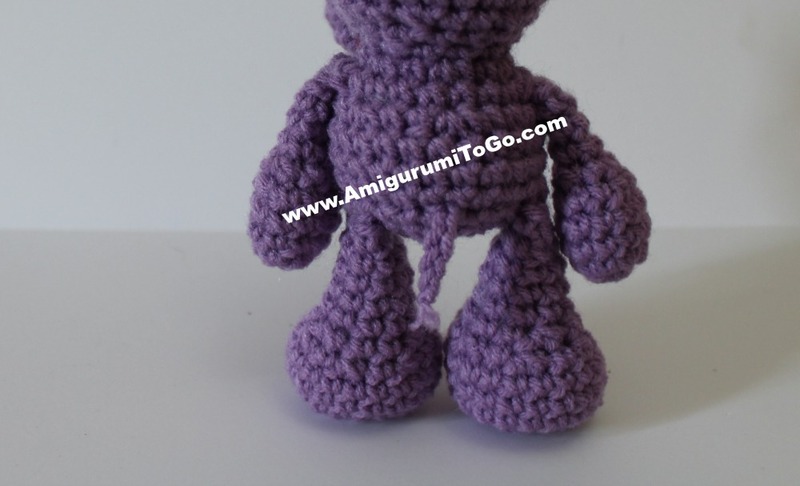 f/o, pull tight and cut the yarn tail to about a 1/4 inch and fray it. You can add these after the legs are sewn in place. Bring a white strand of yarn through the center hole of row 1, come out in between the 3rd and 4th row then wrap twice around the 4th row. Bring the yarn needle back into the foot and over just a bit then wrap the next toe. Add 4 then bring the yarn needle back through the center hole of row 1, knot the yarn tails, then push the knot into the foot to hide it. You're done! 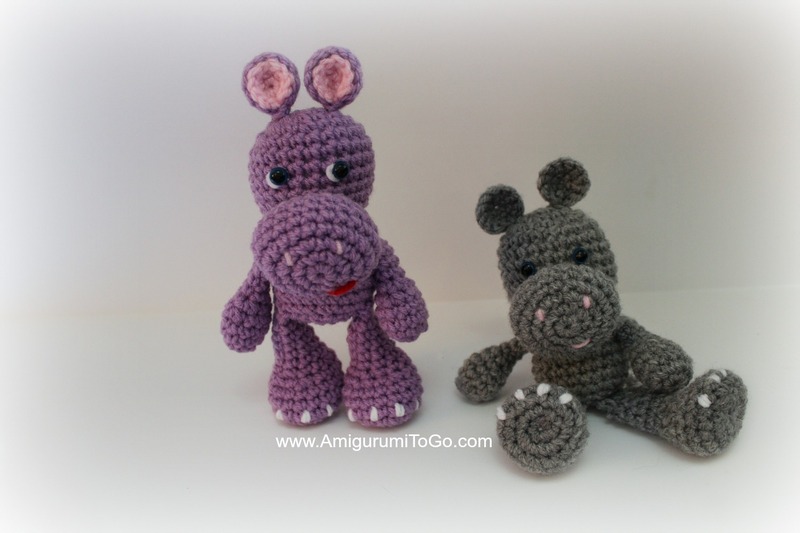 I hope you enjoyed making this little hippo. Clothing for it will be posted first chance I get. 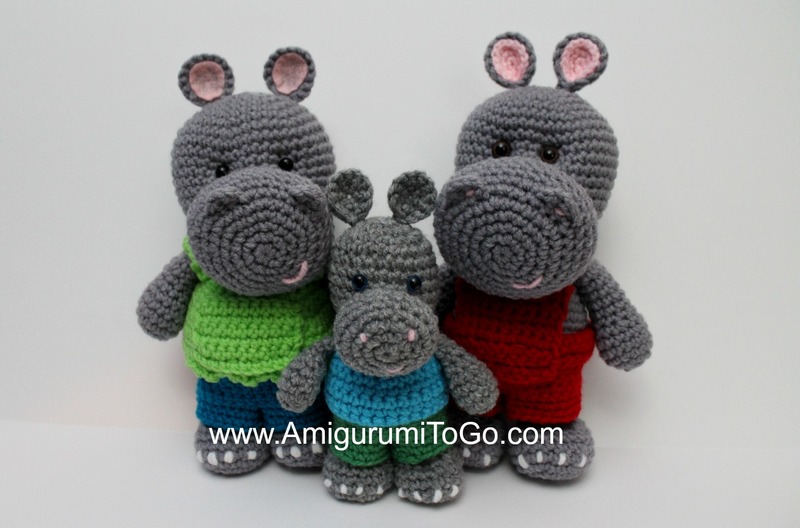 Check back for pattern links and updates. love het little bigfoot hippo, made the large one with clothes, so hope you have the pattern soon ready for clothes for the little one....so lovely a hippo family thanks!!!!! !